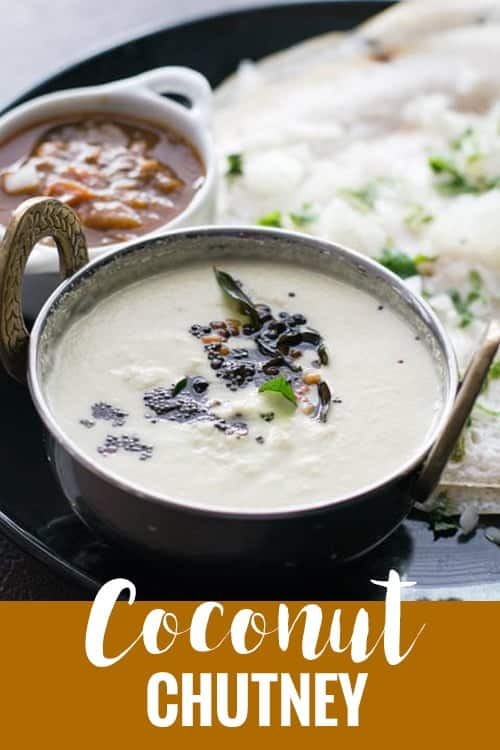 How to make coconut chutney? Well, this is an easy side dish recipe for Idli or for Dosa or for any other South Indian breakfast. This coconut chutney is absolutely creamy texture and which very rich in aroma. South Indian breakfast item cannot be separated from this. 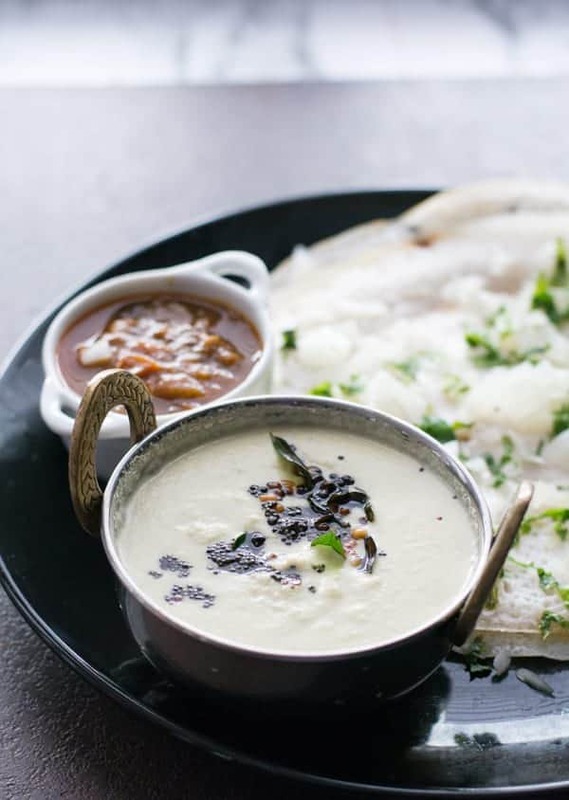 It just like coconut chutney and South Indian breakfast food are inseparable. 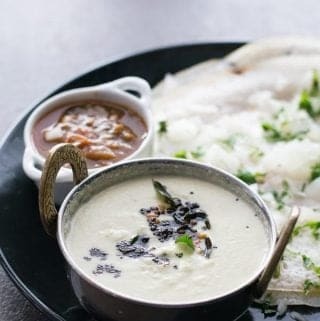 Whether it is idli, Dosa, Vada, bajji, adai, Pongal whatever the breakfast food, we make it with this white chutney. Coconut is known for its medicinal benefits and we believe that it is good for maintaining stomach health. I remember that whenever I have mild stomach burns, the first thing that my mom would give me is a glass of coconut milk. And now I can guess the coconut just added more to Tamil cuisine to compensate and the spiciness we include. Our ancestors have built our diet plan in such a way to balance all these factors together. So the lesson I learned from this does not avoid any ingredient or vegetable. Being a south Indian, this is one of the Chutney which I make almost every other day. The ingredients required for making this recipe is very few. And more customization options are available. Where you can you can make it according to your preference and the availability of the ingredients. Though this recipe needs very few ingredients, the availability of these is rare at times. Roasted gram is a unique ingredient which is widely available in Tamil Nadu, India. It may also be called as chutney dal or roasted Bengal gram or bhuna chana. Coconut chutney can also be made without roasted grams if it is not available in your region. You may substitute roasted grams with peanuts, but the taste would be entirely different. For variations, you may also add a small piece of ginger or a small piece of garlic or few springs of coriander leaves or few mint leaves or all or any of them. Each added ingredient will bring out unique taste and flavor. You may also substitute green chiles with red chilies or capsicum. 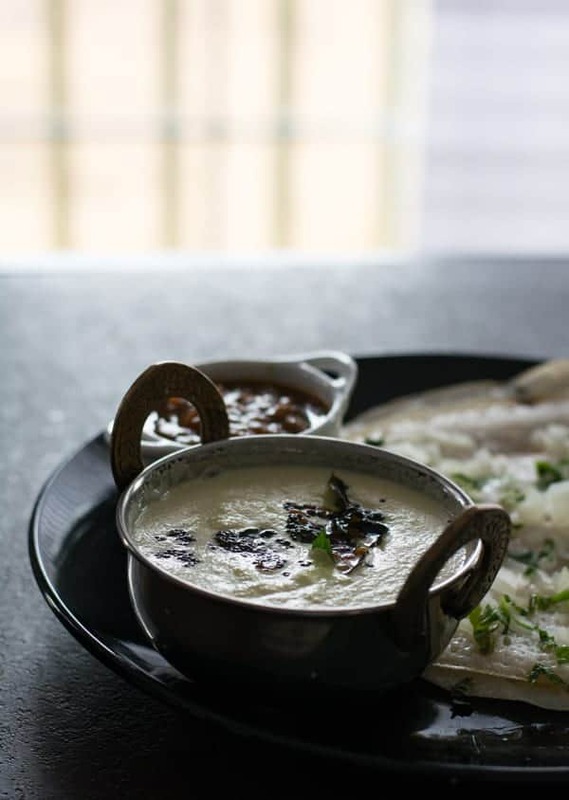 Are you’re planning to serve this coconut chutney with rice? Then increase the quantity of roasted grams and reduce the water to make it to a thicker consistency. Which we call it ‘thuvayal’. Best dishes to be served with this coconut chutney are idli, dosa, bajji, vada, adai, mysore bonda, pongal etc. Making chutney from the fresh coconut is always advisable and it is really really good for the health. But getting a perfectly matured coconut is always a tougher task outside of Tamil Nadu and Kerala. Here in the United States, we do get but I feel getting a perfect one is a kind of win-win situation. Most of the time it might be ended up in having over matured or stale one. The best coconut for making coconut chutney should neither too matured nor tender. The mature coconut will give out some oily nutty flavor. And the tender coconut gives out the gooey texture. Though it is tougher to get perfect ones here, we gifted with the frozen grated coconuts. Where can I get the frozen coconuts and how to use it? It may available from your nearby Indian stores in the Frozen sections. And I used to microwave it for 30 seconds before grinding for the chutney. Can coconut chutney be frozen? Yes, you can freeze on this chutney. But care should be taken as ground coconut is very sensitive towards time and temperature. So freeze it as soon as you make it. I would advise you to freeze it before seasoning. For thawing, leave it over the kitchen countertop to bring it down to the room temperature or you may microwave it for few seconds. Though chutney can be frozen, I would personally recommend you to consume the coconut chutney as a fresh. In a mixer jar, add grated coconut, roasted grams, green chilies, and salt. Add water and grind it to a fine, smooth paste. And transfer it to a serving bowl. Heat pan in medium flame, add a teaspoon of cooking oil, mustard seeds, urad dal and curry leaves. Allow the mustard seeds to splutter. Add this to the chutney, and feel the aroma that spreads into the air. Serve it with your main dishes. How to make coconut chutney? Well, this is an easy side dish recipe for Idli or for Dosa or for any other South Indian breakfast. This coconut chutney is creamy texture and has a rich flavor. In a mixer jar, add grated coconut, roasted gram, green chili, salt and water. Add mustard seeds, urad dal and curry leaves. Allow mustard seeds to splutter and urad dal to become golden brown. Now, super creamy and tasty coconut chutney is ready. Thanks such a comfort side dish for the breakfast. Tjanks for sharing..we started including this nowadays.. Very glad you liked it Ssvani!